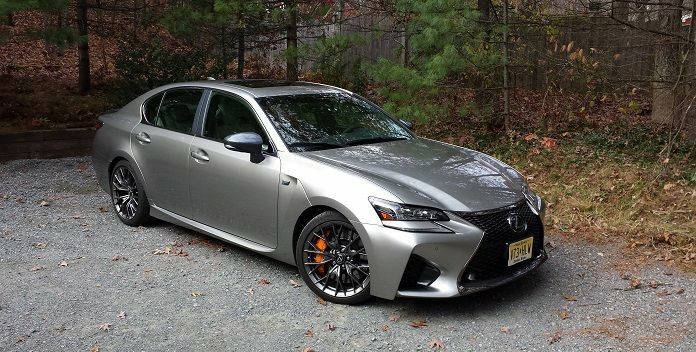 The $87,275 2017 Lexus GS F is an unusual sedan. Not many V8-powered, rear-wheel drive premium sedans exist anymore for under one hundred grand. Lexus puts its own spin on the midsize, up-powered sports sedan with the GS F. If you are looking for the car with the best spec sheet or the one the car magazines tell you that you should want, the GS F is probably not for you. However, if you want a fantastic car from a company with the best reliability and best value, coupled with an amazing driving experience, read on a little bit and hear what we have to say. We have tested this car on the track and on suburban and highway roads. Here's our take. The GS is a great line of sedans from Lexus. If you are a fan of the brand, you will like what you find. The rear-wheel-drive layout and 8-speed automatic transmission are the foundation of the drivetrain in this line. However, the GS F has the up-powered engine option, a 467 hp 5.0-liter normally-aspirated mill that loves to rev. The GS F has a torque-vectoring differential that helps the car turn in in extreme situations. We tested the RC F on track with and without the TVD and it didn't make much of a difference to us. You may be more adept at feeling the difference. The GS F also has outstanding front seats (image) with gaps for a racing harness (or to give the appearance of seats that might have a racing harness). Not only do they look fantastic, they are comfortable on normal long-distance drives and supportive on-track. Lexus also adds HUGE Brembo brakes. Our car had the $300 optional orange-painted calipers, which we would pass on if we had the choice. On the back of the car, there is a carbon fiber lip spoiler. That seems like a waste of money to us given that the weight savings are negligible, but, folks shopping this segment seem to like carbon fiber, so there you go. On-track, the GS F is a great-handling car. It has minimal body roll, excellent steering, and perfect brakes. What impresses us most about the GS F, like the RC F, is the outstanding transmission. You can take control yourself, or let it predict your shifts and aggressively downshift in its Sport modes. There are more powerful V-8 sedans in this class. You can get a 707 hp Charger Hellcat for less than $87K. But a Charger is not a Lexus, is it? If you plan to drive your GS F on-track often, we'd suggest buying an RC F coupe instead, but they feel very similar, so maybe the added two doors make sense. With our limited track abilities (which exceed almost any "normal" sports car owner's), the GS F has plenty of power. It is much faster than we are and it would take us a long time to be able to wring out all of its speed on a track. On-road the GS F is a fantastic car to enjoy. The 467 hp is there, but not obnoxious unless you pin the accelerator and wake up the exhaust. The GS F can be super-fast on public roads, but it is also a comfortable cruiser. One thing we will point out is that one needs to be involved with the car if instant acceleration is desired. Either by using the paddles to keep the engine in the power band or by simply choosing one of the modes above "Normal," such as Sport or Sport+. Otherwise while cruising at 40 MPH in 8th gear there can be an instant of hesitation while the car shifts down to 2nd or 3rd to move things along. Handling is tight and steering sharp. The GS F is a great back-roads burner. The brakes are absolutely perfect. Lots of pedal feel and big stopping power easily modulated. Comfort is relative. Do you like a firm ride, but not jarring? This is your car then. We wished there was a "Comfort" mode that would have smoothed out the broken up New England back roads a bit more than "Normal" mode does. Having owned an RX with this exact infotainment setup, we are unable to tell you how easy the system is to operate upon a first-time setup. We can say, "you get use to it." We don't love the remote touch interface mouse, and we don't like that it pushes away the cupholders. The $1,380 Mark Levinson sound system is very good and much better than most premium audio systems. However, it does not compare to the more expensive Bowers and Wilkins systems we have recently tested in BMWs and Jaguars. Our GS F came with automatic emergency braking, adaptive cruise control, and one of the best automatic high beams systems we have tested. There were no adaptive headlights and no head up display we could find though. There was also no heated steering wheel. Finally, no Apple Car Play and Android Auto. We have vowed never to buy a new car without Apple Car Play and Android Auto ever again. The 2017 Lexus GS F is a great sports sedan. It does not win on paper against a handful of other cars in its class, but on-road it is as good or better than them all. The lack of Apple Car Play and Android Auto is unforgivable to us, but the car does come with navigation included and the GS F can read you your incoming texts if you want it to. Overall, we found the GS F to be one of the best luxury sports cars we tested this year. The Lexus shines in almost all the practical real-world ways a great car should.